Seven Stories Press, 9781609807757, 272pp. The documentary film of The Best Democracy Money Can Buy is available on DVD from CinemaLibre Studio. 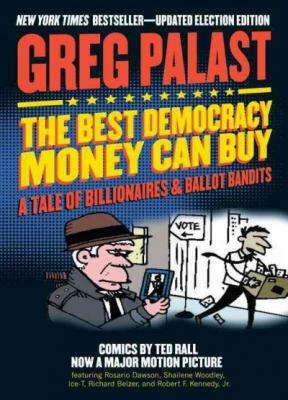 Bestselling author GREG PALAST's most recent book is Vulture's Picnic. Author of a number of previous bestsellers, including Armed Madhouse, Greg Palast is currently a Nation Institute Fellow and BBC correspondent. He lives in New York City and Long Island. ROBERT F. KENNEDY JR. is the dean of the Pace University School of Environmental Law, chairman of the Riverkeeper Alliance, an attorney representing victims of voting rights violations, and contributing editor to Rolling Stone magazine. TED RALL's political and social commentary cartoons have appeared in hundreds of publications, including Rolling Stone, Time, Fortune, the Washington Post, the Los Angeles Times, Village Voice, and New York Times. A finalist for the Pulitzer Prize, he has twice won the Robert F. Kennedy Journalism Prize. Visit him at Rall.com.